These are the trips we’ve done over the last few years with the Land Cruiser, the right two thirds is what we’ve done in the last few months. Blue dots are just location highlights. A bit the same as when we headed up to the Red Centre for ‘Part 1' of this trip, we lucked right in for our first night’s campsite. Mullinger Swamp, on the SA/VIC border. We explored the south east of our home state. This is limestone country, so there are many cool sinkholes. Some are big tourist attractions, others like this one, you have to find for yourselves. Feast’s Classic Car Museum, Port Macdonnell, South Australia. We found this kooky little museum. Cars, and oddities. The extensive model car collection was the best for me, including a whole section dedicated to James Bond cars. We made our way north-east, this would be our general direction aiming to be a Coffs Harbour on northern NSW coast for the WRC round in mid November. We stayed on dirt as much as possible. Next up was the Grampians Mountains in north west Victoria. Pretty but too busy for our liking. So we camped a bit further out. On another lake, this one man made, and recently stocked with a couple of hundred thousand native fish to get more people to come fishing here. It was still cold enough and legal to have a fire at this time. The fire pit is a backpacking one by American brand UCO. It works well enough for two people, and is a fraction of the price of the Snowpeak fire pit. Next was our first day of proper ‘wheelin’. First this rutted sandy track we had driven past coming back into camp the previous day so we just checked it out to see where it went. Then that afternoon we were in the ‘Pyrenees’, not the European ones but somewhat smaller version in Australia. What looked pretty straightforward on the map turned into a whole network of trails, we never did get to the camp we were trying to get to, after we burned too much daylight tackling a monster hill we found ourselves on. The mods we had done before this trip (lockers and new suspension) meant we were able to burble up here relatively easily. It’s days like this I know why I stick with solid axles. Nothing but sky through the windshield never gets old. Of course photo doesn’t do it justice, but if you know, you know. Several km of this, some nasty drops off the side. I was over it by the time we finally got to the top. Not to mention feeling it in my legs the next day after walking so many sections. 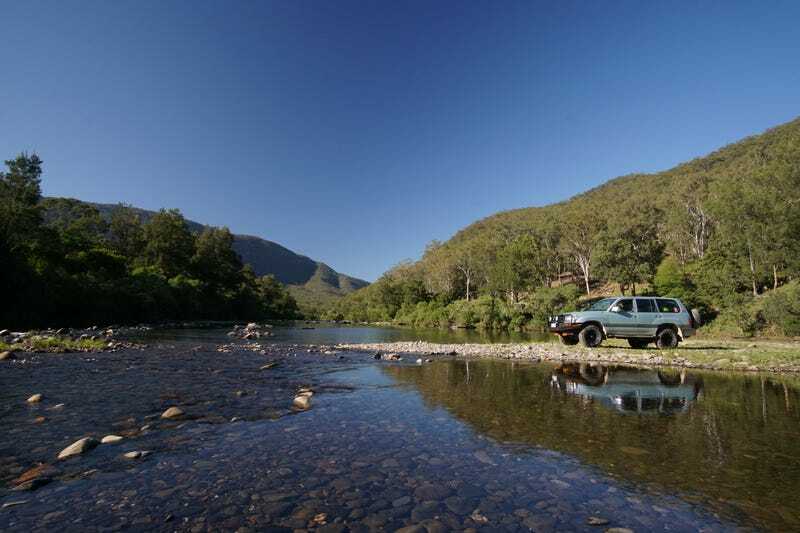 The Pyrenees if one of Australia’s few ‘unknown’ 4x4 destinations. We saw many many trails, some considerably too difficult for us. There are also some other great attractions in the area, wineries and such. It’s not too far from where we live, so I’ll be back. We kept trekking north east, through plenty of cool country towns. Finding campsites using the app Wikicamps, which is a blessing and curse. Making it easy to find camps in areas you are not familiar with, too easy really. There wouldn’t bee too many campsites left in Australia that aren’t on it. Luckily you can filter by things like 4x4 access, that tends to weed out the busier ones. Visiting country towns is definitely one of the things we enjoy about exploring like this. Remote bush camping and 4x4 adventures are great, but I like to mix it up with some country town character and history too. This pub, was adjacent to a reserve we were free camping on in a one pub town. Not only did it serve cold adult beverages, but the best homemade beef jerky we had the entire trip. I didn’t really dig jerky beforehand and the others we’ve tried since have been disappointing for one reason or another. I would have stocked up if I had known there was such variation! Next area we stopped in was Barrington Tops. Pretty high by Australian standards, we managed to get up here and camp for a few nights as a bout of hot weather hit. Going to altitude to escape the heat is a rare occurrence in Oz. Being in eastern Australia, civilisation is never far away. However the wilderness is so dense in this area that planes have crashed here and never been found, despite multiple search attempts. Great camping and some good trails. About the next week was spent exploring up through northern New South Wales. Beautiful green countryside, as different from South Australia as you can imagine. If the stars aligned this is a part of the country I could see myself living in. We ended up camped on the banks of the Boyd River, in the Nymboida area. Somewhere we had visited with the Range Rover Club of Brisbane, many years ago. Honey Bee Eater, we had seen these birds everywhere from the Red Centre to where we were now. Normally too fast/small to photograph with my rudimentary gear, the gang who called the Boyd River home allowed me to get close enough for some useable shots. Get that tent up and that flysheet on before the rain hits! Next up was spectating the WRC in Coffs Harbour. A bit of a strange location for a rally as it turns out, and not a great spectator event compared to others I’ve been to. However seeing the current WRC monsters up close was awesome. Dude, where’s the rest of your car? Ott’s car not much better. The young flag waving Estonian group of supporters in attendance reminded me of the group who used to follow Petter Solberg around, back in the day. Toyota key came in handy at the spectator special. Our original plan was to start heading south down the coast from here. However, being in Coffs Harbour for about a week and talking to other travellers meant we didn’t think we would enjoy that so much. So we headed a bit further north, and east (inland) ending up just over the border in Queensland. By this time the Cruiser was due a service too, I had collected the parts from Toyota at Coffs, time to find somewhere to fit them - it’s little things like this that you don’t necessarily think of before hand- where does one do an oil change if not in their drive? The beach drive that went nowhere. Look CAREFULLY at the map people. Crispy pork thai salad. As most of the country now was in fire ban season, all of our cooking was done on our Trangia. That’s me on the edge of an ancient volcano. We had literally driven into the clouds couldn’t see anything out of this viewpoint. It was so dark under the canopy and with torrential rain on the way in we were using spotlights at 11 in the morning. Border National Park. Staghorn fern growing in this tree. So, I’m clearly not going to fit all the highlights into one post. I’ll get another couple of parts up before we hit the road again.